Polaris submersible pumps feature suction screens or strainers that are made from the same abrasion resistant High Chrome white iron or corrosion resistant CD4MCu duplex stainless steel as the balance of the pump wet end components. After all, this is where the slurry enters the pump and these components are subjected to the same abrasive wear and corrosion as the rest of the wet end parts. 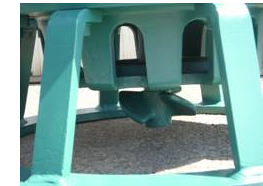 We also designed our pumps to have a separate pump stand to safely carry the structural load of the pump assembly rather than having a perforated sheet metal stand-screen fabrication that will weaken and deteriorate as wear and corrosion progress.